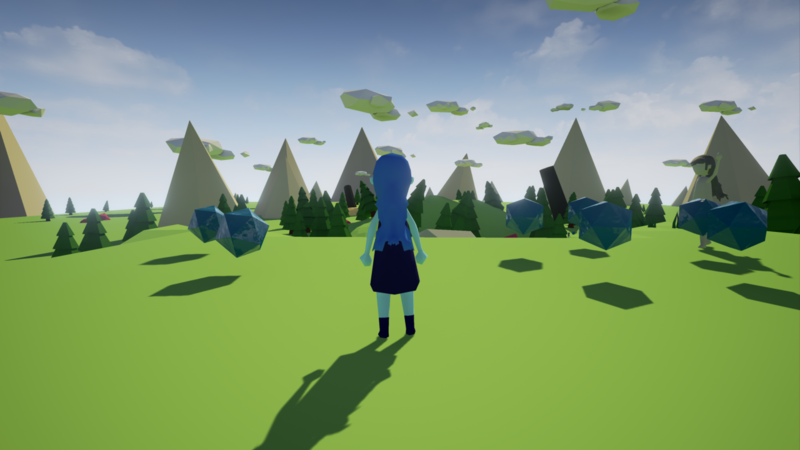 A World, At Peace began as an exercise in game development using Unreal Engine 4, and 3D modeling in Cinema 4D, for my second-year design studio course at New Jersey Institute of Technology. 3-4 weeks production time, with no prior knowledge of the programs. Additionally, I applied my current experience in music composition for original music and sound. It was exhibited and critiqued on December 21, 2016. 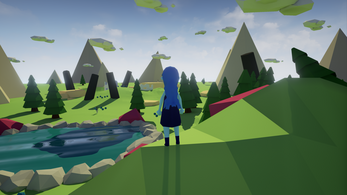 The itch.io version of A World, At Peace has been slightly enhanced to include random spawning between two set collectible patterns, added and edited dialogue, and other minor fixes. A World, At Peace will always remain free to download. If you choose to donate an amount of payment, your kindness and support are gratefully appreciated. and of course itch.io, for allowing me a platform to freely distribute this. Game powered by Unreal Engine 4. Character animation powered by Mixamo. Alt + Enter for fullscreen. Such a nice and peaceful little game, loved it! I love the pretty atmosphere and the openness of the world (for a small, 5-minute game, that is). It seemed like it was trying to get deep or meaningful with a story/theme and never actually got there. 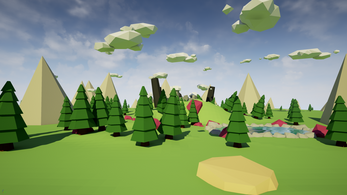 I didn't really get much anything out of playing it, except inspiration to keep modelling in Blender. I guess I underestimated the effect of the ambiguous nature of the story, since I keep receiving so many good critiques on it. Probably should've added a bit more story content right before the credits. And it would have been so easy to do, too! Ah, next time, next time. Really cool game, and it does give you a dilemma at the end. 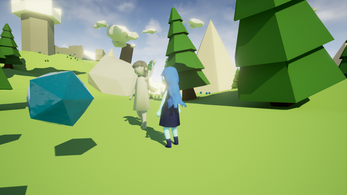 This is a beautiful game, reminded me a lot of Fruits of a Feather, which was another game I played recently on Itchio, in that it's also very simple in design yet very tranquil with a lot of ambience. For a student project, this is very nicely put together, noticed some graphical errors here and there but nothing game-ruining. I quite enjoyed this short little game. I feel like it had a lot to say. Its a nice little game although the ending is quite abrupt. It would be great if you could expand on this or make another title but for something made with so little experience in game development it is very good. I feel like there was a lot of the story that wasn't told, but it was still nice to have the little bits here and there. Ending felt very sudden... but still a very enjoyable experience <3 Hope to see more from you! Ah yeah, the jump-run, haha! Simply a product of not having enough time towards the end to implement a true jump animation for the running one to change over to. Glad you enjoyed the game! Good game! Short, easy and relaxing. "I'm recording this early in the morning"
I loved the game! Don't take any of my jokes seriously because they were just satirical. This is a very relaxing and beautiful game! And obviously peaceful! The ending leaves alot up to your imagination and lets you make up your own story of what happened later! It didn't hit me until after I recorded, but were the collectibles blue on purpose? Because I realized that it could be a reference to the Matrix about the blue pill (as well as what I talked about in the video). I LOVED this game, and I would like to see more like this! I loved the music, the story, and the choice at the end. It could be fleshed out a little more, but it did its job for what it was, and it did its job very well. I highly recommend it! Unfortunately I didn't make them blue on purpose, but that's an awesome connection I hadn't realized! Brilliant game, awesome job man! However, if I do not receive extended versions of the soundtrack I believe I will have to riot. Gave this game a go and in all honesty it was one of the most relaxing/peaceful indie games I have ever played. Would love if you made it a full game! great game, would have loved to know more about what happened and where exactly we are, I didn't know exactly but I'm guessing our character died and now has to decide if she wants to stay in the afterlife forever or move on and vanish? thanks for playing!! I like your interpretation of the themes; the story was left a bit open-ended like that intentionally for some light theorizing. when I wrote the story I thought of the world as a place the character could come to when they needed to relax, and had the statues comment on whether it is a "good" or "bad" choice to stay in that feeling forever, not able to experience anything other than that, or to return to normal life. Great Game especially for a one-man project. Keep up the good work! thank you! loved the gameplay! thanks for playing, loved the playthrough!